Sen. Susan Collins, R-Maine, and Sen. Lisa Murkowski, R-Alaska, are shown during a news conference at the Capitol in Washington, Feb. 15, 2018. The Senate battle over Donald Trump's new Supreme Court nominee is off to a fiery start, even before the president makes his choice. Republican and Democratic leaders traded accusations and barbed comments Thursday on the new vacancy, abortion rights and the debate to come. U.S. Sen. Susan Collins said Sunday that she won’t support a U.S. Supreme Court nominee who has “demonstrated hostility” to Roe v. Wade. Justice Anthony Kennedy announced his retirement from the Supreme Court on Wednesday, giving Trump the opportunity to nominate a second justice and cement conservative control of the nation’s highest court. The news has sparked concern among supporters of abortion rights that Trump’s pick to replace the 81-year-old Kennedy could overturn that ruling. As a candidate, Trump made clear he would appoint pro-life justices who would overturn the 1973 ruling, according to The Washington Post. 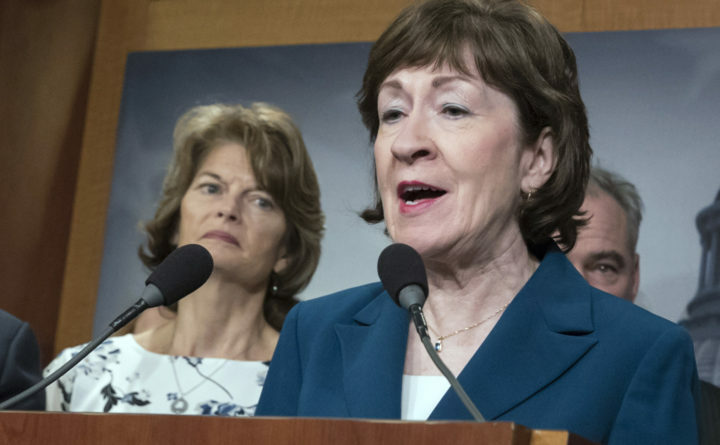 Collins said Sunday that Trump made clear to her during their meeting last week that he wouldn’t ask his list of potential replacements for Kennedy whether they would overturn Roe v. Wade. “So I think what he said as a candidate may not have been informed by the legal advice that he now has that it would be inappropriate for him to ask a nominee how he or she would rule on a specific issue,” Collins said. Collins noted that she isn’t “comfortable” with everyone on Trump’s shortlist to replace Kennedy, noting that in 2005 she voted against confirming one of them, Judge William Pryor, to the Court of Appeals for the 11th Circuit. Collins also said she encouraged Trump to “broaden” his list beyond the 25 potential nominees already on it. Trump told reporters Friday that he plans to begin interviewing candidates Monday and name his nominee by July 9. With Republicans holding only a 51-49 majority in the Senate, Trump’s next Supreme Court pick has a narrow path toward confirmation, making the votes of moderates like Collins and U.S. Sen. Lisa Murkowski of Alaska, both supporters of abortion rights, key to determining who will fill Kennedy’s seat. Senate Majority Leader Mitch McConnell of Kentucky said Wednesday on the Senate floor that he anticipates voting on Kennedy’s successor in the fall. In March 2017, Collins endorsed Trump’s first Supreme Court nominee, Neil Gorsuch, who replaced the late Justice Antonin Scalia. Gorsuch was confirmed after Senate Republicans refused to hold hearings in 2016 on former President Barack Obama’s nominee to replace Scalia, Judge Merrick Garland, though Collins had called on her colleagues to consider his nomination. In April 2017, Collins joined her Republican colleagues in a party-line 52-48 vote to change Senate rules so that Supreme Court nominees need only a simple majority rather than a supermajority of 60 votes to be confirmed, a move that gives minority Democrats little hope to prevent a vote. When asked on “State of the Union” whether she thought Justice Gorsuch would vote to overturn Roe v. Wade, Collins said no, adding that she believes Gorsuch, the co-author of a book on precedent, understands that precedent is essential to the U.S. judicial system. Collins, who is among senators being targeted by supporters of abortion rights ahead of the nomination, said in a separate Sunday appearance on ABC’s “This Week” that a nominee who would overturn Roe v. Wade would signal an “activist agenda” she doesn’t want to see in a justice seated on the court. “A candidate for this important position who would overturn Roe v. Wade would not be acceptable to me,” Collins said. U.S. Sen. Tammy Duckworth, D-Illinois, appearing separately on “State of the Union,” urged Collins to be skeptical of a nominee’s claims to support precedent, noting that Gorsuch joined his four conservative colleagues on the court to overturn precedent in last week’s ruling in a labor union case, Janus v. AFSCME. “And so I would say to my colleagues … to not just trust that what somebody says to you in a conversation trying to get your vote is what’s going to happen when they are on the Supreme Court,” Duckworth said.